I'm back to work since Sunday morning. I was thrilled to be back at the office. I missed my friends and the stay-at-home vacation got me all fired up to take calls once again. :D Now I agree that vacation leaves are the best medication for being burn out from work. Recently, the management are giving out incentives for overtime takers. Agents got even more enthusiastic on extending a few more hours at work to take advantage of the perks. As for me, I render OT's on my rest days. Some of my colleagues are doing the extremes. Some seemed like they don't sleep anymore. That for sure, I won't do to myself. I'm too scared to get sick. Besides, how will you be able to provide good customer service when you're exhausted? Well, it seems like it works for them but not for me. This is actually just a quick post. 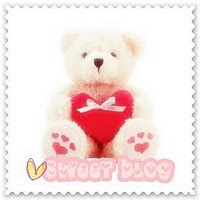 Anyone can grab that sweet bear and tag it to sweet people you know in the blogosphere! I have to go to work!